It was the early 2000s, and Steve Masapollo was about to take the leap and quit his job managing a chain of psychiatric-treatment centers and start his own solar-installation company. The market was wide open, and the combination of state and federal incentives was an alluring package for homeowners who could afford solar's hefty up-front price tag. By early 2009, Masapollo said, his company was approaching $100 million in sales. But almost three years later, as incentives for homeowners to go solar have diminished, he has watched the industry shift. It has gone from a small cast of homespun contractors installing modest, rooftop systems to large projects undertaken by big out-of-state solar companies and the utilities themselves. "It's getting like the Wild West," said Masapollo, CEO of SolarWorks NJ in Washington Township. "You have these California companies come in with the lease deals, and the utilities are putting up 20 megawatts here and 20 megawatts there." The boom-and-bust atmosphere that has overtaken New Jersey's solar industry - ranked second in the nation after California - has made for tough times for those companies that were the backbone of the state's solar revolution. They had thrived for years in what was a niche market, propped up by state rebates and federal grants. Then regulators created something unique at the time in the country, replacing the rebates with a market-based system in which solar customers of all sizes earned credits based on how much electricity their systems generated. Those credits could then be sold to utilities and other polluters who were required to cut fossil-fuel emissions. Some environmentalists feared it was too early for such a move, that the industry was still too fragile to exist without rebates. Those concerns proved unfounded. Over the last year, New Jersey has seen its solar capacity more than double, with a pipeline of large-scale solar farms set to come online in the years ahead, according to the New Jersey Office of Clean Energy. Assemblyman Upendra Chivukula (D., Somerset), a longtime advocate of solar technology, said he was as surprised as anyone. "A lot of things were happening. The federal government through the stimulus program was giving out grants . . . [and] the cost of the solar panels came down," he said. "When we passed the law in 2010, we never thought there would be so much solar." Everyone joined what one longtime proponent called a "gold rush." Contractors who had watched the home construction market implode went back to school and opened solar-panel installation businesses. The high value of the solar credits spawned interest from large, heavily capitalized companies as well. KDC Solar, in Bedminster, received a $225 million investment from the New York-based private-equity firm Diamond Castle Holdings L.L.C. in 2010 and now has plans to build 150 megawatts of solar capacity in New Jersey over the next three years. The state's solar capacity currently totals a little more than 500 megawatts. PSE&G, the state's largest electric utility, has built more than 50 megawatts of capacity over the last two years with plans for 30 more by the end of 2012. But as more and more solar farms are built, the value of the solar credits in New Jersey, known as Solar Renewable Energy Certificates (SRECs), has fallen by more than 50 percent in the last year. Some wonder whether the prices are set to fall a lot further. Chivukula has introduced a bill to speed up the state's alternative-energy goals, in hopes of increasing demand for SRECs. For larger companies that can manage multiple multimillion-dollar projects at a time, the faltering SREC market presents an opportunity. "We're bigger, and there are risks we can take that some companies can't," said Al Matos, vice president of renewables at PSE&G. "As the subsidies diminish, it's the experienced players with strong balance sheets that are going to prosper. Not the guys out for the quick buck." In a speech this summer, Gov. Christie pushed for large-scale solar projects over the 5-kilowatt rooftop systems that had been the primary beneficiary of the state's incentive system. The argument is that New Jersey will never achieve its goal of generating 23.5 percent of its power from alternative energy sources by 2020 if the industry is catering only to those who can afford or get a loan for the $30,000 up-front cost of the average residential solar system. But some are pushing for a more balanced approach. "We want to see these big commercial projects. They're cheaper, and they bring more energy to the grid. 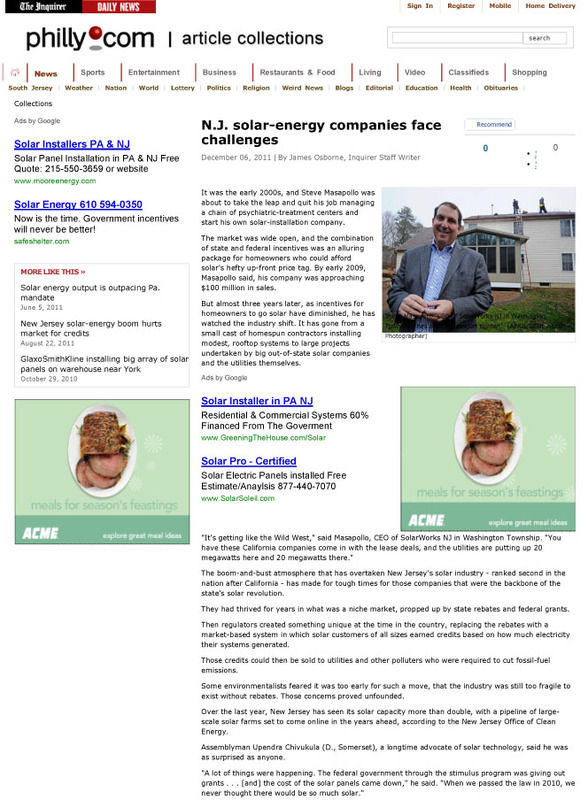 At the same time, every ratepayer is supporting New Jersey's solar effort, so the residents should also have access," said Matt Elliott, an advocate with Environment New Jersey. For companies that make their living in the residential and small-business market, the transition has been tough. Mercury Solar Systems, with three offices in the state, including one in Mays Landing, laid off a sixth of its staff this year and is now counting on a partnership with SunRun, a California solar-panel leasing company. Under a leasing arrangement, the firm installs the panels at little cost to the customer, who sees some but not all of the financial benefits. "We have to partner up with people to provide the financing," Mercury president Jared Haines said. "You had a bunch of mom-and-pop companies dealing in certain counties, but they're getting pushed out. Everyone's just trying to figure it out." Meanwhile, outside a client's home in Williamstown on Monday, Masapollo of SolarWorks said he did not expect to be pushed out. He was on his way to a meeting in North Jersey to bid on a solar-farm project, and he was hopeful he could win the job over some of his larger competitors. "No matter what the industry is, you get this David and Goliath thing," he said.